If I had known from the beginning what he would do to me, would I have changed anything? No matter what had happened with him I never would have been led down the path that brought me to my soul mate. For that I could never be sorry. I just wish I'd had time to make my time count. I wish I'd been able to see her grow. I wish I could have said goodbye, to have felt his touch one last time. The other man in my life took that away from me but I would never change a thing. Although he was my undoing he was also my saviour, I just wish I could have been his. This is my part of the story. 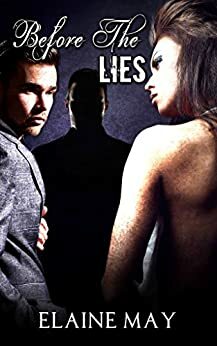 Before The Lies is a prequel to Elaine May's successful Truth series, although it can also be read as a standalone novel. Readers should be aware of its uncompromising storyline as it depicts the harsh reailty of Rosa's story. Have you ever read a novel so heartbreaking that it shatters your heart into a million pieces? Have you ever read a novel so breathtakingly beautiful that it simply takes your breath away? Have you ever read a novel so raw and confronting that it leaves you utterly speechless? Have you ever read a novel so sinister, manipulative and evil that it leaves you questioning everything? Well we just found it. Before The Lies is a prequel to the Truth Series. For all of those who have read the Truth Series we know about Isla and her amazing story. What was her mother Rosa like? The answers are in this amazingly written novel that had us simply captivated from beginning to end. It’s raw, highly confronting, powerful, heartbreaking, heart-warming, just an amazing read. It tells a tale of a young girl living in hell and makes the decision to trade her current hellish life to a new one. It tells a tale of a young girl grasping at anything she can to feel love. It tells a tale about a girl who goes from one nightmare straight into another. It tells a tale about hope. It tells a tale about trust. It tells a tale about love. You name it, this novel has it. Elaine May has given us an absolute gut wrenching read that shouldn't be missed. Her writing ability and strength had us clinging onto every word read, every page turned. She held us hostage with her beautifully descriptive and in-depth words. We were absolutely flawed by this novel. To Elaine we say thank you. Thank you so much for giving Rosa a voice. Thank you for giving us Before The Lies. A definite 5 star read. 3.0 out of 5 starsNot my cup of tea. This book was great up until the end, then I got the feeling the author was ready to end the book. I read the end several times thinking I missed something but sadly no. Ms. May does am great job bring the characters to life, which I would have rated a 5 but I felt slammed with the end. Rosa Smith's parents have one goal in mind and that is to marry her off to a rich man who can save their business. It doesn't matter that she is only 15 years old as they rarely want her around. They think they have found a potential candidate in American John Bryant. His good looks instantly attract Rosa and soon she realizes she is in over her head. Yet as good as John is to Rosa he has secrets that he is keeping from her. When the chance comes for Rosa to leave England and head to the US with John she agrees not knowing what she surprises await her. Yet when she realizes everything is not as she expected it to be will she have to courage to put her own happiness first? This is the third book in the series but is actually a prequel to the first two. This book explains so much but I think I enjoyed reading it after the first two as it made everything fall into place. Rosa was someone that was after love after being treated so badly be her parents. With John she felt such an attraction and initially he was so good to her. Then as you see that other side develop you learn how trapped and controlled she is and how she has no say over anything. I knew what was coming due to the previous two books but I liked the way you never really knew how far John would go with things. John is just such a mixed bag capable of such evil things yet he also had a side that was so loving and caring. You never knew what you were going to get and I was super disappointed to know the kind of man he turned into and how he raised his son, Jack, to be. It's super frustrating that the Bryant family has no idea what John is capable of and I am definitely interested to see if Marcus shows up in anymore books! 5.0 out of 5 starsA lovely story! This a story about finding yourself, sadness, anger, fear, the journey from child to teenager and teenager to woman. It's about understand the path you travel is fraught with wrong turns, bumps, potholes and paths that branch off into a little something I like to call destiny.... It's about lust, first love, free falling in love with a person whom you know is literally the other half that makes you whole.. It's about knowing what is good for you and loving yourself enough to not settle on a life that is strife with anger, pain, sadness, soul wrenching despair, physical and emotional abuse. It's a beautiful story of a young girl turned woman named Rosa, who finds someone to love and someone who deserves her unconditional love and devotion! Mrs. May, has the ability to kick you right in the feels, yet still leave you able to walk away with tears in your eyes, a smile on your lips and the unfocused glaze that only a good book can give you!!! I recommend this author and her books for anyone who loves a beautiful romance with a realistic view of what some people do go through when falling in love and finding your future self.. 18+up due to adult situations. A story of a young girl, naive, vulnerable and innocent who by the lack of love from her parents was easily deceived mislead and whisked away to America by John an older man who made promises of a better life only to have Rose kept like a whore in a flat and visited when he pleased. Parts of this plot frustrated me, Rosa was a young girl who was groomed and blinded by love and I hoped the story would change course and would of gone down a different route on so many occasions but each time I felt hope it fizzled. I felt the story pick up and I enjoyed it more when Rosa met William there was more conversation where as up to this point it had just felt like a story. The whole concept of the plot I enjoyed but more conversations and thoughts from the characters would of pulled myself as a reader in more also Rosa having a bit more backbone, why didn't she tell Will, why didn't she contact her friend again, her parents? I felt there were huge gaps and I was left with so many why's. The End - no words really, just, I love HEA'S that bring closure to a story especially when the main character has been through so much already.